Partial-coverage slipcovers aren't uncommon outside the US, especially with limited-edition steelbooks in Asia, but there aren't too many North American Blu-ray releases that have come with 'em. 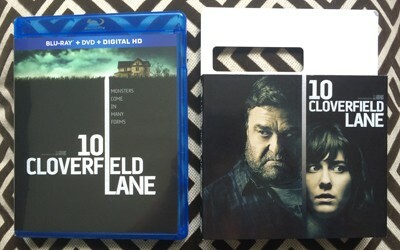 10 Cloverfield Lane arrives with one, though, a two-thirds sized slipcover that features the faces of John Goodman and Mary Elizabeth Winstead that isn't shown on the more streamlined cover artwork underneath. The interior is standard procedure for Paramount, though: both Blu-ray and DVD presentations have been included in the two-disc set, while an Ultraviolet Digital Copy Slip covers the left-side disc. 10 Cloverfield Lane has a handful of stretches that occur above ground, but the bulk of the story relies on the atmosphere of the fluorescent lighting, the metallic and concrete infrastructure, and the general claustrophobia of Howard's fallout shelter. That doesn't prevent the Red EPIC Dragon-shot cinematography from relishing unique plays on depth of field, camera angles, and texture, though, and Paramount's 2.35:1-framed, 1080p AVC digital transfer brilliantly carries over every nuance found within. Details in John Goodman's stubbly close-ups and in the textiles of things like shower curtains, crutches, stairs, and lampshades are impeccably sharp, while the soft glow of a jukebox and the snapped-together piece of a jigsaw puzzle offer hints of color in the stark surroundings. Black levels are divine and keep all details visible within, though some faint digital/compression noise gives higher-contrast lighting some roughness. Skin tones are appropriately warm, responding to the different shades of warm and cool lighting throughout the bunker, and the moment of vigorous action keep every nuance and pixel clearly under control. Very well done. But, man, does the Dolby Atmos track -- which downscales to a phenomenal 7.1 Dolby TrueHD presentation -- really deliver a punch, overshadowing the capable digital transfer. Sonic atmosphere is vital to keeping the film's intentions in check, and the high-def presentation of the rattling walls, the buzzing lights, and the rumbles of activity going on above ground push the limit with the full surround stage wherever it's necessary. The harsh clanking of metal rings on metal bars and the slam of an ominous locking door result in punchy higher-end clarity, spreading capably across the front channels. Much of 10 Cloverfield Lane hinges on tense scenes driven by impassioned dialogue, though, interrupted by slamming fists and rumbling in the air for effect, which sustains an articulate, natural balance throughout -- whether Bear McCreary's emotive scoring is present in the background or not. Despite taking place largely in the space of an underground bunker, there's a lot of direct and atmospheric activity going on in 10 Cloverfield Lane, and it makes for a potent aural experience. French, Spanish, Portuguese, and English Descriptive 5.1 Dolby Digital tracks and subtitles are available. 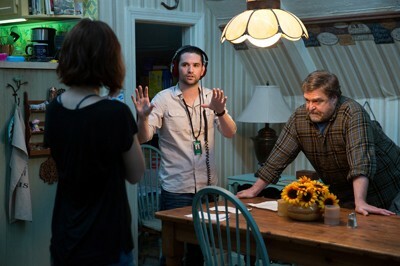 Director Dan Tractenberg is all enthusiasm when it comes to participating in his first commentary, with producer J.J. Abrams guiding the discussion with nudges and prods toward topics that the audience would find interesting. They discussed the non-verbal, intimate aspects of the film's tone and storytelling, making the most of their "lo-fi" filmmaking for grand results, how the unveiling mystery has a little something to do with videogame-style narratives, and the usual suspects in terms of minor details: necessary digital effects, the intentional color choice for a wall, the meaning behind a lightbulb, and landing on ambiguous takes for Howard's character. It's a tad congratulatory in tone toward Abrams, feels somewhat repetitive as it goes forward, and Tractenberg's newness to the commentary format can certainly be felt, but the discussion about finding the right tone with Howard's menacing attitude and how each scene has some kind of unique thought put into it -- referencing Kill Bill, Rosemary's Baby, and other films -- makes up for the initial ungainliness. 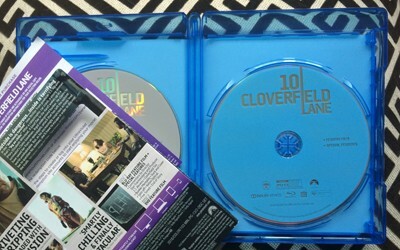 Paramount have also stitched together a series of seven total Featurettes (34:42, 16x9 HD) that tackle individual topics through the making of 10 Cloverfield Lane, cobbling together intimate interviews with the cast and crew (Tratenberg, Abrams, actors Mary Elizabeth Winstead and John Goodman, cinematographer John Cutter, and others) as they discuss the process. After Cloverfield Too tackles the general discussion about the individual players, the rest of the featurettes -- titled Bunker Mentality, Duck and Cover, Spin-Off, Kelvin Optical, Fine Tuned, and End of Story -- elaborate upon the nitty-gritty of constructing the film, from the origin of where Howard's head was at while building his bunker to other production details about protective gear, doing as much in-camera effects as possible, and the "secret" production wing of Bad Robot. And there's also an entire segment devoted to Bear McCreary's work with the score, which offers splendid insights into his style and giving the film a "broader" feel. A surprise both in the stealthiness of its release and in the vigor of its indie sci-fi aims, 10 Cloverfield Lane tells a confined, harrowing story within the same relative universe as that of Bad Robot's monster-disaster movie. This one's quite different, though. Driven by an ambiguous yet menacing performance from John Goodman, a story revolving around apocalyptic fear and dangerous exertion of control takes shape within an enclosed fallout shelter, generating relentlessly absorbing tension and grim ponderings about whether to trust the doomsday stories told by someone whom you cannot fully trust. Director Dan Tractenberg transforms the small scale of the scenario into a thematically and emotionally robust escalation of tension, mounting to a wild finale befitting the Bad Robot pedigree. Paramount's Blu-ray looks and sounds tremendous, and arrives with a solid commentary and about thirty minutes of insightful featurettes. Highly Recommended.